Vision Ahead is not your typical young-gun-goes-for-the-jugular release. 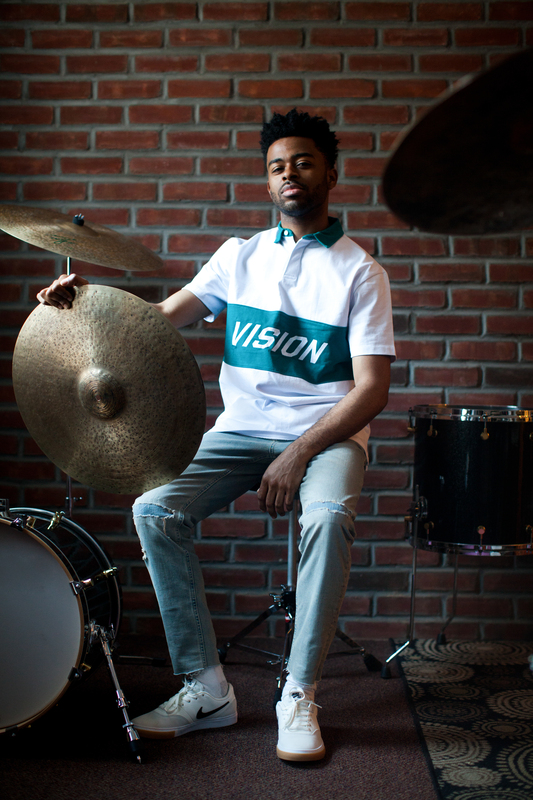 Thoughtful and expansive, informed by shimmering drumming and memorable compositions, it’s thoroughly modern in its jazz conception and attitude, and finds the twenty-eight-year-old Jonathan Barber surrounding himself with former classmates from the Hartt School in Connecticut performing his material on eight of the album’s twelve tracks. Barber emerged from Hartt with ambition and talent to burn. Upon landing in New York in 2017, he quickly began leading his own after-hours night at cozy jazz haunt Smalls. Word spread, and employers got Barber’s number. He’s currently a member of groups led by Marcus Strickland and Jeremy Pelt, and has performed with Jimmy Greene, Erykah Badu, Wallace Roney, Kenny Barron, John Patitucci, Kurt Elling, Terrace Martin, Charnett Moffett, Stanley Jordan, Harold Mabern, Steve Davis, Larry Willis, Abraham Burton, and many more. Recordings like JD Allen’s Bloom and Grace, Jovan Alexandre’s Collective Consciousness, and Nat Reeves’ State of Emergency point to a strong career with many recordings to come. MD: Your brother passed midway through the recording of Vision Ahead. That sentiment of loss can be felt in a couple tracks. Jonathan: My brother passed in November 2016. I had the quintet at that time; we’d all gone to Hartt together. We formed a bond and once I moved to New York, I needed a name for the band. I went to Virginia to spend time with my brother’s wife and kids, and after that reflective point, a light bulb went off and Vision Ahead came to me. That’s the direction, the name of my band and my record, and also the mission statement of my moving through this transition of losing my brother. I thought it would be therapeutic to dive into that. And I felt I should compose music for the record. Some drummer/bandleaders don’t compose, but I definitely want to be seen as a composer and not a drummer only, and to erase that stereotype that drummers don’t write music. MD: The album works like a suite. Jonathan: I wanted to create a body of work. We live an industry where everyone is releasing singles. I wanted to make a record that you could play from start to finish, and that has an arc, a rise and fall. I wanted to embody that in my music. And not so much do “drummer” tunes—I wanted to compose some emotional and musical songs. MD: Are the drums treated on any tracks? Jonathan: I wanted to find that middle ground between a traditional jazz sound and a modern sound. On tracks like “Time Will Tell” you can hear the modern production. Other songs I wanted to create a sound where I do both. That also relates to bass drum tuning. I like that “thud” and some punch, but in the production of it I wanted to challenge the direction of jazz records. Often you create jazz records straight, with just a touch of production, but with technology it’s good, as jazz musicians, to pay closer attention to the overall sound and balance of the band. MD: You’ve toured with trumpeter Jeremy Pelt and saxophonist Marcus Strickland, whose recent Twi-Life record is heavily produced. How did you recreate those drum sounds on the road? Jonathan: I brought my Sunhouse Percussion sensors and I also used a Roland SPD-S pad. There were 808 sounds, and I was triggering samples. And with Sunhouse you can pitch-bend notes. Marcus used a James Baldwin sample on one track. MD: Why are employers hiring you? Have you found your niche? Jonathan: It’s a number of things. It’s important to be a good person and be responsible and reliable, so people can count on you. And people can count on me to deliver and give the music a spark. Being a drummer, you have to keep the time, but also you’re the engine. Right now I have a lot of energy and passion, and I love what I do. I enjoy accompanying people and playing their music. I guess people like my sound. MD: How do you prepare yourself for months of being on the road, often in foreign lands? Jonathan: You have to be mindful, because you bring everything to the bandstand. You may have an early call, and then a flight, and then you check in at the hotel, and then an hour before sound-check you get dressed…you have all these factors and the last thing you want to do is bring a bad vibe to the bandstand. People are coming to see the show, so you want to perform at your best. And mentally you want to be at your best. You have to keep morale at a high level. You might not always see eye to eye with the other musicians, but you have to show respect for one another. You won’t get recommended for a gig if you don’t get along with everyone. You have to be able to play and have a good vibe. MD: Did you sub for other drummers when you arrived in New York? Jonathan: Yes, I subbed for my instructor Eric McPherson when I was at the Hartt School. Sometimes in our one-on-ones he’d throw strange, odd-metered music at me and not tell me anything about it or supply a chart. I had to figure it out. So I developed good intuition, developed my ears, and realized that you can train yourself. Now if I get a piece of music, it doesn’t take much time or energy to get it, and I develop certain devices to help play things that may be challenging at first. It’s important to be able to play something without seeing it on paper. MD: What’s your warm-up regimen on the road? Jonathan: I always want to be in shape, and on the road if you’re playing every night, you keep in shape. But I also want to keep my hands strong. I don’t have a strict regimen, but I will play the rudiments in repetition. MD: What are your long-term goals as a drummer? Are there specific things you want to master? Jonathan: I want to increase the size of my drumset. Recently I’ve been playing a 22″ bass drum and cranking it and getting that high tone with some punch. One hard thing about living and gigging in New York City is that you can’t bring a bunch of drums. It’s bad enough carrying a heavy bag of cymbals. I love using a standard hoi-hat with 14″ cymbals and a remote hi-hat with 18″ or 20″ cymbals. I have holes on the top cymbal, which gives the hi-hat a quick chick. You’d think big hi-hats would be slow and slushy, but those holes give them a really fast response. MD: Conceptually, what are you thinking? Are you happy where you’re at, or are you thinking beyond? Jonathan: I’m always trying to progress. I’m comfortable with my sound, but of course I want to sound better and I want more from myself. I’m big on executing my ideas. I want to check out as much music as I can to gain inspiration, but I mainly want to execute and be articulate. I don’t want to have any hiccups in relaying an idea or playing something. Being put on the spot and playing a solo can be hard–what do you do? I want to be open and free with my limbs to do whatever my heart desires. MD: Any advice to drummers on their way to New York City? Jonathan: Save your money. Save up to three months’ rent to get adjusted to the city. And try to check out as much music as you can. This is a networking scene. You have to meet people and network. Being able to play good time is important, whatever that is: swing, Latin, groove, pocket…. A drummer who plays good time will work. We have all these flavor-of-the-week [musicians], but a drummer with good time and a good feel will always work. One challenge for me was pacing myself. New York is overwhelming, and you feel like you have to do it all. But don’t burn yourself out. That’s not productive. Barber plays Canopus drums, Istanbul Agop cymbals, and Sunhouse Percussion, and uses Promark drumsticks and Evans heads.